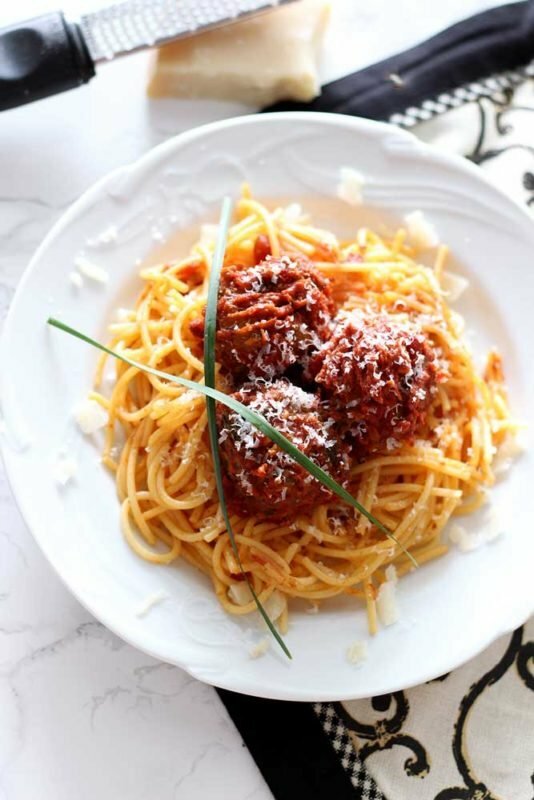 There’s nothing better than a homemade authentic Italian Marinara with Meatball dish that has been passed down for decades!. This pasta recipe features a sauce made with fresh basil and oregano mixed with crushed tomatoes and classic Italian herbs and spices. The meatballs have fresh basil and oregano mixed in and are big and full of flavor with every bite! We all have that friend or family member that is constantly sharing recipes they love. Personally, I LOVE getting recipes from others that are amazing (hence, my website name….Recipes Worth Repeating). I love the variety of recipes I get and I love to try new foods, so I’m super thankful for my aunt Sondra who sends me recipes and for my aunt Elaine who shared a lot of her recipes with me before she passed away to be with the Lord. Gosh, I need to post some of her recipes on here. I have some classics sitting in my recipe book!! 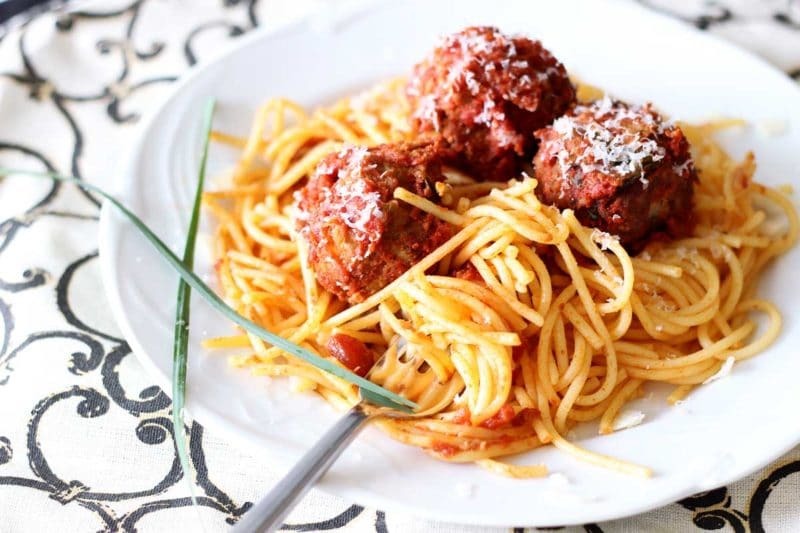 My friend Lindsay is another person who is always sharing a lot of yummy recipes with me, like this Feta and Sun-Dried Tomato Turkey Meatloaf and these Turkey Tots, but I think this Italian Marinara with Meatballs recipe is my all time favorite of all the recipes she has shared. With this recipe came the story about how her Italian family has been making this dish for years! 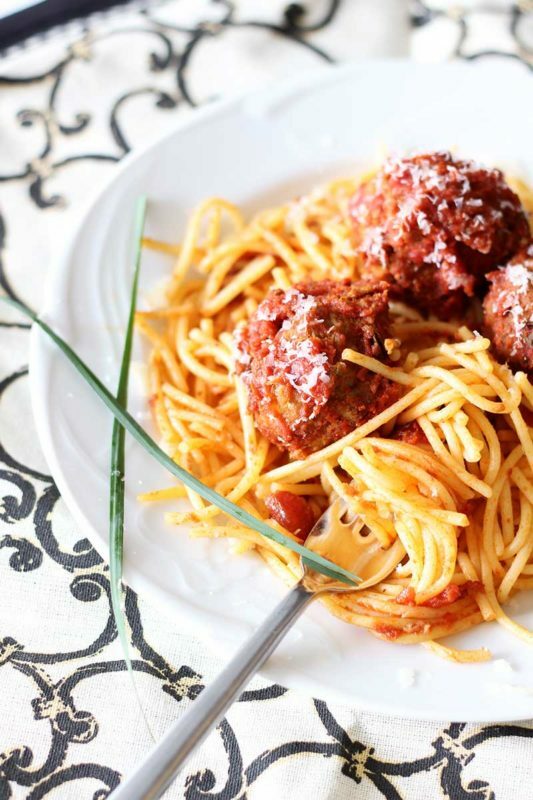 Ya’ll…let me tell you, this authentic Italian Marinara with Meatballs dish is a classic! Look at those meatballs! This dish features a lot of fresh basil and fresh oregano, mixed with other Italian spices. I think that’s why I love this recipe so much. It’s screaming authentic flavor with every single bite! Plus, this dish is made in the slow-cooker so that makes it super convenient and super tasty because all these Italian ingredients have time to meld and marinate together. Is your mouth watering yet?! To make the sauce, you literally throw in the marinara ingredients into the crock pot. From there, you’re going to mix up the ingredients to make and roll your meatballs. 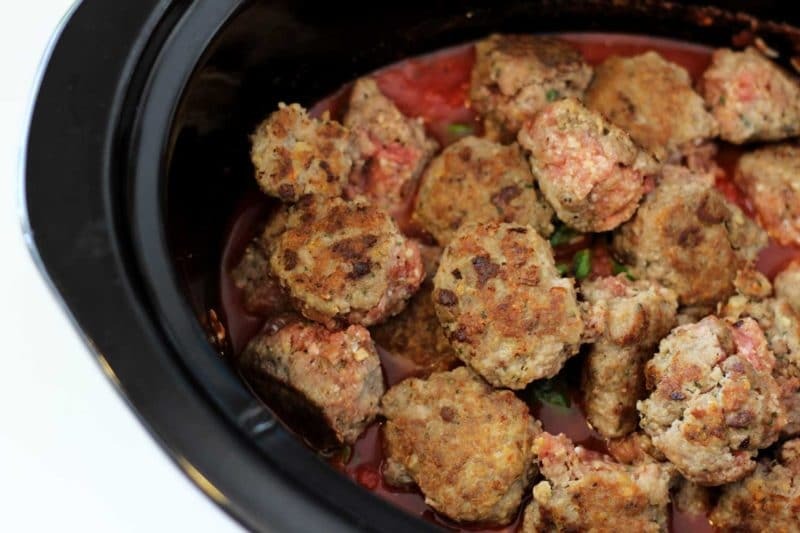 Before adding the rolled meatballs to the slow-cooker, you’ll first need to brown them on the stove. You’ll add 2 teaspoons of extra virgin olive oil (use flavored oil if you have it on hand) to a skillet and brown the outsides of the meatballs. This step is crucial! If you don’t do this step, the meatballs will fall apart in the sauce while everything is cooking. The intent is to brown both sides of the meatballs, not cook them all the way through. They will finish cooking in your slow-cooker. Once the meatballs are browned, you’ll spoon them out of the skillet and place them on top of your sauce. You’ll then gently spoon some of the sauce on top of the meatballs before placing the lid on and letting the slow-cooker do all the work. You’re going to let this recipe slow-cook for 5 hours. About 20 minutes before the sauce and meatball are scheduled to be done, I make my gluten free spaghetti noodles. I drain the noodles and make my plate! This recipe can be made gluten free if you use gluten free noodles and gluten free breadcrumbs. Oh and by the way…Lindsay add a Young Living Essential Oil called “Taste of Italy” that contain basil leaf oil, Oregano (Origanum vulgare)† aerial parts oil, Oregano (Origanum minutiflorum)† aerial parts oil, Oregano (Origanum onites)† aerial parts oil, Oregano (Origanum majorana)† aerial parts oil. This add is optional, but adding it really enhances the taste of this dish! To find out more about this oil from Young Living, read about it here: Order Young Living Oils. You can also order the oil from their website! You guys, I’m telling you…you are really going to enjoy this recipe! It’s a repeater for sure!! And if you just can’t get enough of my pasta recipes, you have to check out these favorites like my Garlic Basil Chicken Pasta with Alfredo Sauce, Penne Pasta with Italian Marinara Sauce and my Chicken Florentine with Sun Dried Tomato Pasta…so yummy!! There's nothing better than a homemade authentic Italian Marinara with Meatball dish that has been passed down for decades!. This pasta recipe features a sauce made with fresh basil and oregano mixed with crushed tomatoes and classic Italian herbs and spices. The meatballs have fresh basil and oregano mixed in and are big and full of flavor with every bite! 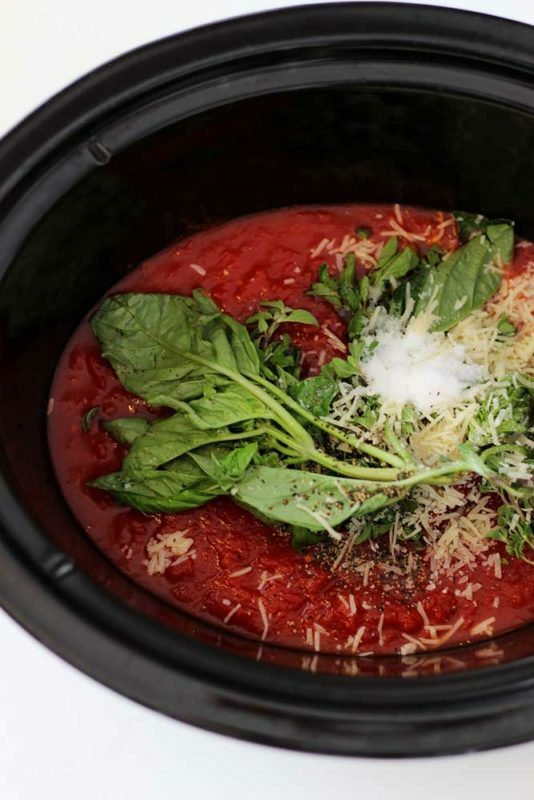 Combine all marinara ingredients in a slow-cooker, stir together. Turn slow-cooker on low heat. Roll mixture into medium sized balls (about 1.5 to 2 inches thick). Add 2 teaspoons of extra virgin olive oil to the skillet and brown the outsides of the meatballs before putting them into the slow-cooker (If you don’t do this step, they will fall apart in the sauce). Place the lid on the slow-cooker and cook on low for 5 hours. About 20 minutes before the sauce and meatballs are finished cooking, make your favorite pasta and cook according to packaged directions. When you remove the meatballs from the sauce at the end, do so with a slotted spoon to catch the basil and oregano leaves/stems to remove them from the sauce. Once the meatballs and sauce are done, serve on top of a plate of pasta! Top with fresh Parmesan cheese! 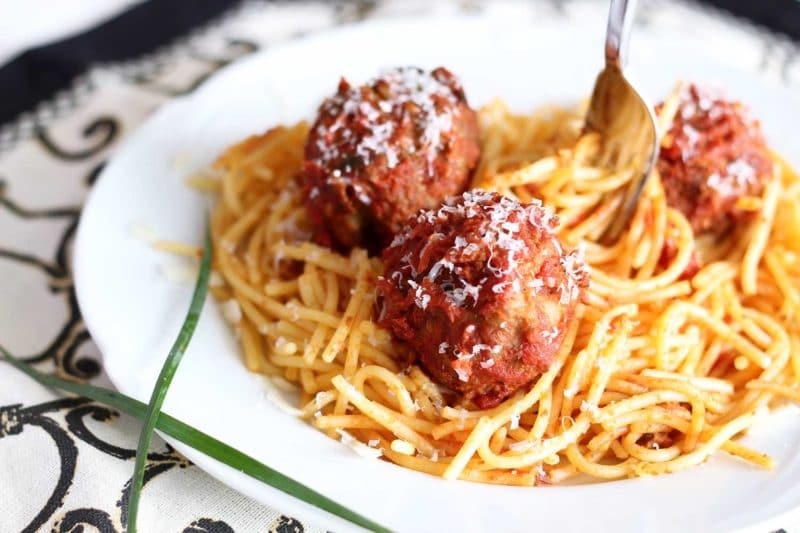 I’ve made 2 recipe cards for you because I love these meatballs and the sauce over spaghetti but I also love to eat the meatballs by themselves as a snack! Pin this recipe on your favorite PASTA board on Pinterest! Using ground beef will work out just fine! Use your 1 lbs of ground beef in substitute of the turkey and ground sausage. You can leave the rest of the recipe the exact same. Let me know if you have any other questions and let me know how it turns out!